This is an exciting dual lane slide, that's always a kid favorite. Nothing like slide races! The unit has a front access climb lane, with No-Jump protection at the top. 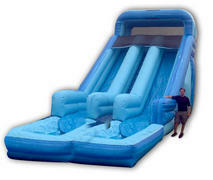 This is a giant Water Slides your guest will hours of fun with. Just add water, stir with a few kids and watch the fun brew!